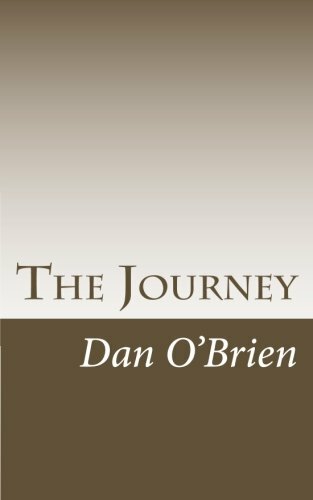 Ana Mardoll's Ramblings: Author Interview: Dan O'Brien on "The Journey"
Ana: Today we have Dan O'Brien introducing their novel, The Journey. I haven't read this book myself, but Dan was kind enough to agree to guest blog about their book to any readers who might be interested in the subject. Dan, how would you describe your novel to your prospective readers? In broad terms, what is your novel about? Dan: The Frozen Man. The Translucent Man. The Burning Man. The Wicker Man. The guide known only as the Crossroads, together these are the signposts and totems of the world that the being called the Lonely inhabits. Seeking out the meaning of his journey, the Lonely is a being consumed by philosophical inquiry and adventure. Filled with exotic places and age-old questions, The Journey is a book that seeks to merge the fantastical and real. Join the Lonely as he seeks out answers to his own existence and perhaps the meaning for us all. The Journey is many things. While it is philosophical in nature, it explores the issues that face all of us. There is a fantastical element that guides readers along, coaxing out the best possible experience while reading the novel. Dan: The Journey explores a few themes. Chief among them would be the first question posed by philosophers: who are we and why are we here? The journey of life is varied and complex, but is entwined by a singular thread: searching for a sense of belonging, or a purpose. How does the pursuit of such heady questions influence the nature of how we perceive ourselves – and to what extent do we contemplate such issues – is juxtaposed with characters that are archetypes of the types of people we encounter throughout our lives. Dan: I started writing this novel because I was struck by the necessity to create something deeply moving and philosophical. I had always enjoyed novels by Gibran and Hesse and I thought I might attempt to contribute to that genre on some level. At the time, I was engaged in a lot of philosophical discourse, so it seemed to be a timely novel to tackle. Dan: If you loved Ishmael, The Giver, or The Prophet, then you will want to read The Journey. First and foremost, the novel focuses on asking serious questions and demanding deliberation about potential answers. The background is firmly rooted in fantasy, which sets it apart from all three of the novels to which there is a comparison: The Giver, Ishmael, and The Prophet. It is meant to utilize strong metaphors, and most of all to make the reader think. Dan: I have three other novels in print: The Ocean and the Hourglass, Bitten, and Cerulean Dreams. Four more novels will hopefully be available in 2012: The Fallen Chronicles Trilogy and Deviance of Time. Most of the novels are part of a larger series -- especially Bitten, which is a series of mystery novels that follows Agent Lauren Westlake -- and are of the fantasy variety. The Fallen Chronicles and Deviance of Time are both the beginnings of two vast, epic series as well. Dan: The novels are in both print and Kindle versions here: The Journey, Bitten, Cerulean Dreams. You can follow me on Twitter @AuthorDanOBrien, on Facebook, on my blog, or my website. Ana: Thank you, Dan. I understand you have the first chapter of your novel available as an excerpt for interested readers? And is there anything else you wish to add for our readers? Dan: Yes, there is a Kindle preview online of The Journey at Amazon. Please follow me on Twitter to receive updates. My blog and author page on Facebook also provide timely updates about where my writing is going. Thanks for talking with me today, Ana.